Pygmy goats are popular among goat lovers because they are relatively low-maintenance. A fresh supply of water, forage and feed generally keeps them kicking for many years. They require a small living area and prefer a clean environment. Further, the female pygmy goat provides a considerable amount of milk compared with output of larger animals. Have your veterinarian perform a weight assessment on your pygmy. What you may think is thin may be perfectly normal. The right weight depends on your pygmy’s size. Generally an adult pygmy weighs between 50 and 85 pounds. After assessing your goat, the vet may perform tests to determine if the goat is suffering from an underlying medical condition such as a bacterial or viral infection like pneumonia. Feeding your pygmy goat unlimited grass or hay helps prevent weigh loss, but if the forage is not high in nutrients, you may notice your pygmy losing weight even with an ample amount. 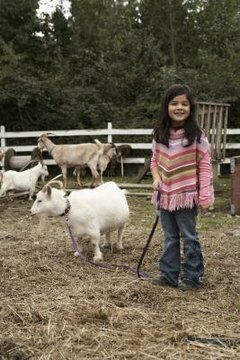 Supplement his diet with a quality commercial feed for pygmy goats. Make sure you do not overfeed commercial feed. The sensitive digestive system of the pygmy is designed to thrive on forage, or hay and grass. Create a worming program with your veterinarian to help keep internal parasites from invading your goat and causing weight loss. When treating an already thin pygmy, your vet may take a stool sample and test for parasites like roundworms or pinworms. A goat should receive tetanus and Enterotoxaemia vaccinations at about 8 weeks old, with the dosage repeated four to six weeks later, according to Pocket Farm Magazine. Administer a booster once a year as recommended by your vet. Preventing weight loss in your healthy pygmy goat with proper feeding and watering is not difficult. Sudden changes in his eating habits or personality, however, may be indicators something is not right. Be sure your pygmy has fresh water at all times. According to Bioexpedition.com, a pygmy may refuse to drink if the water is not fresh, promoting dehydration and possible weight loss. Stick to a strict worming schedule set up by your vet. If you get a new goat, keep him separate from your herd until you can properly worm and vaccinate him. This ensures no new parasites or disease are introduced to your herd.